Spencer: Direct Evidence that Most U.S. Warming Since 1973 Could Be Spurious | Watts Up With That? My last few posts have described a new method for quantifying the average Urban Heat Island (UHI) warming effect as a function of population density, using thousands of pairs of temperature measuring stations within 150 km of each other. The results supported previous work which had shown that UHI warming increases logarithmically with population, with the greatest rate of warming occurring at the lowest population densities as population density increases. But how does this help us determine whether global warming trends have been spuriously inflated by such effects remaining in the leading surface temperature datasets, like those produced by Phil Jones (CRU) and Jim Hansen (NASA/GISS)? While my quantifying the UHI effect is an interesting exercise, the existence of such an effect spatially (with distance between stations) does not necessarily prove that there has been a spurious warming in the thermometer measurements at those stations over time. The reason why it doesn’t is that, to the extent that the population density of each thermometer site does not change over time, then various levels of UHI contamination at different thermometer sites would probably have little influence on long-term temperature trends. Urbanized locations would indeed be warmer on average, but “global warming” would affect them in about the same way as the more rural locations. This hypothetical situation seems unlikely, though, since population does indeed increase over time. If we had sufficient truly-rural stations to rely on, we could just throw all the other UHI-contaminated data away. Unfortunately, there are very few long-term records from thermometers that have not experienced some sort of change in their exposure…usually the addition of manmade structures and surfaces that lead to spurious warming. Thus, we are forced to use data from sites with at least some level of UHI contamination. So the question becomes, how does one adjust for such effects? As the provider of the officially-blessed GHCN temperature dataset that both Hansen and Jones depend upon, NOAA has chosen a rather painstaking approach where the long-term temperature records from individual thermometer sites have undergone homogeneity “corrections” to their data, mainly based upon (presumably spurious) abrupt temperature changes over time. The coming and going of some stations over the years further complicates the construction of temperature records back 100 years or more. All of these problems (among others) have led to a hodgepodge of complex adjustments. I like simplicity of analysis — whenever possible, anyway. Complexity in data analysis should only be added when it is required to elucidate something that is not obvious from a simpler analysis. And it turns out that a simple analysis of publicly available raw (not adjusted) temperature data from NOAA/NESDIS NOAA/NCDC, combined with high-resolution population density data for those temperature monitoring sites, shows clear evidence of UHI warming contaminating the GHCN data for the United States. I will restrict the analysis to 1973 and later since (1) this is the primary period of warming allegedly due to anthropogenic greenhouse gas emissions; (2) the period having the largest number of monitoring sites has been since 1973; and (3) a relatively short 37-year record maximizes the number of continuously operating stations, avoiding the need to handle transitions as older stations stop operating and newer ones are added. Similar to my previous posts, for each U.S. station I average together four temperature measurements per day (00, 06, 12, and 18 UTC) to get a daily average temperature (GHCN uses daily max/min data). There must be at least 20 days of such data for a monthly average to be computed. I then include only those stations having at least 90% complete monthly data from 1973 through 2009. Annual cycles in temperature and anomalies are computed from each station separately. I then compute multi-station average anomalies in 5×5 deg. latitude/longitude boxes, and then compare the temperature trends for the represented regions to those in the CRUTem3 (Phil Jones’) dataset for the same regions. But to determine whether the CRUTem3 dataset has any spurious trends, I further divide my averages into 4 population density classes: 0 to 25; 25 to 100; 100 to 400; and greater than 400 persons per sq. km. The population density data is at a nominal 1 km resolution, available for 1990 and 2000…I use the 2000 data. All of these restrictions then result in thirteen 24 to 26 5-deg grid boxes over the U.S. having all population classes represented over the 37-year period of record. In comparison, the entire U.S. covers about 31 40 grid boxes in the CRUTem3 dataset. While the following results are therefore for a regional subset (at least 60%) of the U.S., we will see that the CRUTem3 temperature variations for the entire U.S. do not change substantially when all 31 40 grids are included in the CRUTem3 averaging. 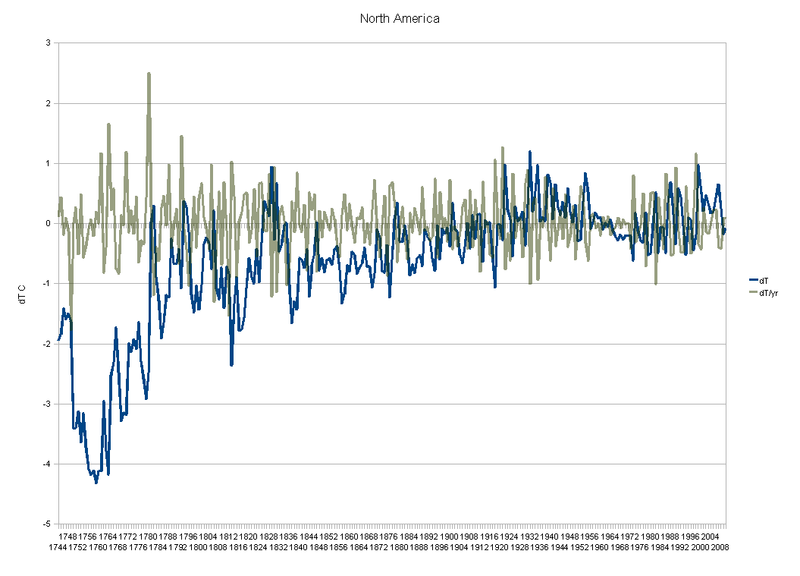 The following chart shows yearly area-averaged temperature anomalies from 1973 through 2009 for the 13 24 to 26 5-deg. grid squares over the U.S. having all four population classes represented (as well as a CRUTem3 average temperature measurement). All anomalies have been recomputed relative to the 30-year period, 1973-2002. Significantly, the warming trend in the lowest population class is only 47% of the CRUTem3 trend, a factor of two difference. Also interesting is that in the CRUTem3 data, 1998 and 2006 would be the two warmest years during this period of record. But in the lowest population class data, the two warmest years are 1987 and 1990. When the CRUTem3 data for the whole U.S. are analyzed (the lighter red line) the two warmest years are swapped, 2006 is 1st and then 1998 2nd. From looking at the warmest years in the CRUTem3 data, one gets the impression that each new high-temperature year supersedes the previous one in intensity. But the low-population stations show just the opposite: the intensity of the warmest years is actually decreasing over time. To get a better idea of how the calculated warming trend depends upon population density for all 4 classes, the following graph shows – just like the spatial UHI effect on temperatures I have previously reported on – that the warming trend goes down nonlinearly as population density of the stations decrease. In fact, extrapolation of these results to zero population density might produce little warming at all! This is a very significant result. It suggests the possibility that there has been essentially no warming in the U.S. since the 1970s. Also, note that the highest population class actually exhibits slightly more warming than that seen in the CRUTem3 dataset. This provides additional confidence that the effects demonstrated here are real. Finally, the next graph shows the difference between the lowest population density class results seen in the first graph above. This provides a better idea of which years contribute to the large difference in warming trends. Taken together, I believe these results provide powerful and direct evidence that the GHCN data still has a substantial spurious warming component, at least for the period (since 1973) and region (U.S.) addressed here. There is a clear need for new, independent analyses of the global temperature data…the raw data, that is. As I have mentioned before, we need independent groups doing new and independent global temperature analyses — not international committees of Nobel laureates passing down opinions on tablets of stone. But, as always, the analysis presented above is meant more for stimulating thought and discussion, and does not equal a peer-reviewed paper. Caveat emptor. March 16, 2010 in Climate data, GHCN, Weather_stations. OT. I do not understand statistics. But there’s a commentator (VS) who is leaving Tamino crazy. He even forgot you Anthony. Our knowledge has been built on sand. And of sand. And in comes the tide. Scottish Secretary Jim Murphy, who is leading UK government preparations for the tour, said it was “an historic visit at an important time”. “The Papal visit represents an unprecedented opportunity to strengthen ties between the UK and the Holy See on action to tackle poverty and climate change as well as the important role of faith in creating strong and cohesive communities,” he said. Is the Vatican invested heavily in carbon emissions trading? Please provide graphical geographic maps (images) of your grid boxes. Something as simple as a 4-color map (a different color, depending on the population level in the grid) would be adequate. Even better would use a different shape or shape size to denote the level of warming in that grid box. Alternately, if you could provide a link to your data as a text file, I could put such a map together myself. Could we use the Surfaces Station Survey approach by organizing regional teams to collect and review the raw data. I visit the Western Regional Climate Center on line and down load the raw data when studying local climate issues. In some cases there are big gaps in the collected data. I have visited some stations and copied the paper records to resolve the missing information. We would need some standard method for dealing with this missing data, so all the teams would be using the same techniques. I am available to work on a team. Thank you Dr. Spencer for injecting some sanity into a field of science that seems to be fraught with emotion. Caveat Emptor indeed. Reproducible, understandable, process and limitations explained, this work certainly doesn’t sink to the low quality we have seen in peer reviewed papers on this subject. From a Gore strategy conference call for supporters. sorry all, I meant “NOAA/NCDC”, not “NOAA/NESDIS”. Must be that age thing. 3. Different heat storage/release and albedo characteristics of the built environment. Items 2 and 3 can change over time with the population density remaining constant. I would also like to postulate a fourth factor – petro-chemical smog. I have just come back from Almaty (Kazakhstan) where this a recognised and very visible problem. In effect vehicles are increasing temperatures by a local ‘greenhouse’ effect. It might be interesting to examine whether the effect of atmospheric fuel residues depends on smog being formed or whether they increase in levels water vapour short of forming smog. 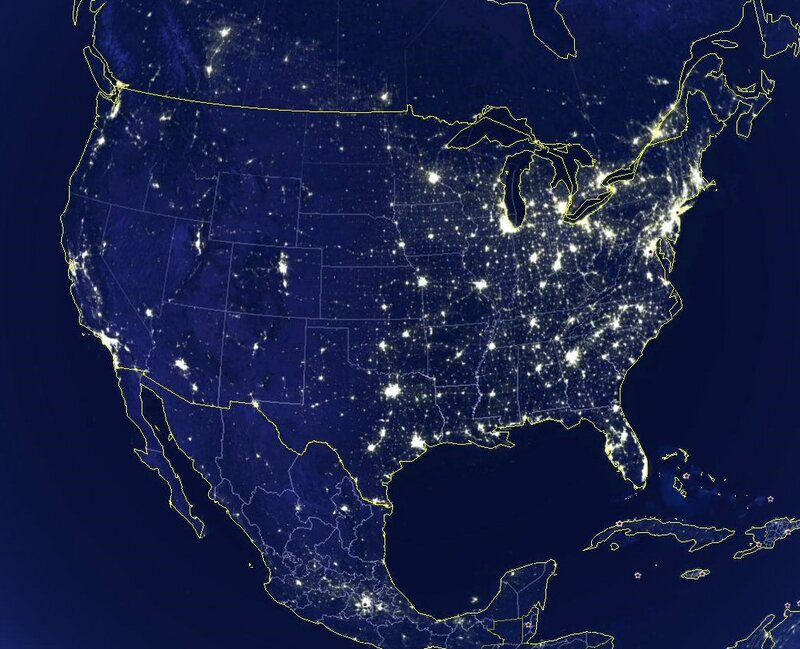 I once had a poster showing a satellite picture of the lights at night over North America similar to the one you show. However, mine showed an almost incredible amount of lights extending half way INTO the Golf of Mexico. It took me a wile to realize that these were not ships or island but probably oil rigs! It made the Golf of Mexico seem to be as populated as the land next to it! That surely also contributes to heat in that area. One more arrow in the elephant. Keep ’em coming. What is the average population density of the US? Based on the graph that shows CRU temp versus pop. density, I would guess 400. Why is the blue line sometimes higher than the red line? It suggests the possibility that there has been essentially no warming in the U.S. since the 1970s. More precise should be, that the linear trend 1973-2009 is close to zero, since there was warming between 1973-1990 and flat trend/decrease since then. Excellent analysis overall. PS Gif format for the graphs should be much better. does anyone have faith in the homogenizing methods actually removing UHI ? From what I see in the GISS dataset they have adjusted old data (60’s, 70’s)DOWN and recent data has been unadjusted … basically a stepped adjustment in the WRONG direction, it should show lower adjustments to older data and greater negative adjustments to recent data. OK. But what about the rest of the world? I think it would be in one sense harder to duplicate the same analysis with the collected stations in, say South America, as the data gathering there has never been so constant as in the US. That said. I expect you would get an even stronger effect due to some of the rapid growth of major cities in the developing world. How good is Russian population density data over time? I want this analysis done on Siberia! Bruntland? That name bells a ring. Is he UNabomber Mao Strong’s good buddy? Or, is she the other Bruntland? “U.N. Climate Envoy: Shift Climate Talks From U.N. The United Nations may not be the best forum for global climate treaty talks after the Copenhagen collapse, said a top U.N. climate envoy. After failing for years to reach a deal among 200 countries, negotiations will shift to more informal talks among a smaller number of key nations in a “double-track system,” said special U.N. envoy Gro Harlem Brundtland on Tuesday. Copenhagen concluded with a nonbinding three-page paper hammered out in an all-night private meeting among President Barack Obama and a handful of leaders, most importantly from China, India, Brazil and South Africa. It fell far short of the summit’s original objective, a full-fledged and legally binding accord setting emission reduction targets for major countries. The Copenhagen experience “will serve as a base for discussions going on this year. It’s not only going to be focused on the United Nations framework, but more on what these emerging economies and big economies are committing to,” said Brundtland, speaking on the sidelines of a world conference on biofuels. Thank you once again Dr. Spencer, for another excellent post. Any light shed on the badly done UHI modifications by GISS, CRU, and NOAA is welcome. Your post reminds me of something that I read recently (I think it was Phil Jones in his BBC interview from last month): he said that they don’t do a UHI correction for London because the population hadn’t changed significantly since the late 1800’s. While the population has only grown from 6.5 million to 7.5 million, this ignores any effects due to modernization–horse-drawn carriages to cars, dirt roads to asphalt and concrete, fewer trees in general, increase in transportation/number of vehicles on the roads, etc. This would be another good area to study. Population density of the USA, according to area and population figures provided in the CIA World Factbook, is about 31.3 people per km^2. It might be a bit more interesting to compare your ISH dataset to raw USHCN data, since the CRUTemp GHCN stations you use have both TOB and inhomogeniety adjustments applied, and the magnitude of those adjustments for the U.S. are reasonably well known. One possibly confounding factor is that TOB adjustments tend to be much greater for rural stations than urban ones, since rural stations are more likely to be co-op stations with irregular reporting times (whereas non co-op stations tend not to need TOB adjustments). I can imagine that many of the AGW “scientists” are beginning to doubt the reliablity of their data, but the politicos will go on and on and on, denying the facts. Not exact numbers obviously, but something like that. Perhaps one of the reasons the plurality of US state maximum temperature records were set in the decade of the 1930s, rather than in one of the recent decades when temperatures were supposed to be rising alarmingly, was because the temperature was not rising alarmingly. Hi Dr. Spencer, very convincing analysis. Would UHI contaminate the UAH dataset also? I ask because, obviously, there is warming shown in that data also. This is always used as a reason to ignore UHI and say the GHCN has it right, so I was curious how you would respond to that. Wow! I actually understood at least 80% of this. Thanks a lot, Dr. Spencer. Dr. Spencer illuminates the dark recesses of climate science. The longer the farce goes on, the more outrageous the alarmist claims become. How much longer can the climate science community keep a straight face? The only crisis we have is in confidence in science. When will the real scientists out there accept they have been hoodwinked and deal with it accordingly? There is a clear need for new, independent analyses of the global temperature data…the raw data, that is. Just needs a PhD to write it up 😉 Source code & links to raw GHCN data free for use. I suppose I could apply your corrective equation for population, but it does not seem necessary. Hi Roy. As a long-time participant in peer-review in the Mathematical sciences I want to say that, while your “caveat emptor” is well taken, it should ALSO be applied to official peer review, which is bad enough in my field, and must be doubly or triply so in a field full of political landmines like yours. In such a case, PUBLIC review may be as valuable, or more so, than so-called PEER review. Indeed, perhaps public review (together with peer review) ought to be considered the gold standard for sciences so enmeshed in public policy issues. I suggest that you’ll get more valuable feedback from a sounding board like this one, populated by interested and well-informed amateurs whose identities are known, than from a panel of peers populated by people with strong prejudices, hiding behind a curtain of anonymity. I read your analysis with interest and will say that you continue to appear to be on to something valuable. But what I see lacking, at least in the exposition, is any accounting for population gradient over time. Perhaps it is a result of hasty writing, but I see no suggestion in the analysis that you have permitted sites to migrate between population classes over time, which would seem something this analysis should be designed to cope with. Indeed, from your opening paragraphs I had thought that this would be the main focus of your analysis. It is something I’m intensely curious about, the uncovering of which to me seems a main goal: when the population density changes at a particular location, is there a demonstrable population-induced temperature change? As you mention, you have already done a (very impressive) study of the the effect of population spacially, from which we can probably infer a rough effect from temporal changes in population, but it would be good to have the temporal effect well-established from empirical data. Perhaps your writeup (or my hasty reading) has missed this, but does your analysis move sites across population groups, or does a site with 0-25 ppk^2 in 1970 remain in this class through 2009, even if in actuality it has grown into the 100-400 ppk^2 class by the end of the study period? If so you are probably underestimating the effect of UHI, and the classes are cross-contaminated in the time direction. The period 1970-2009 is probably good in a fourth way: you should be able to get reliable population density data at all NA sites during this entire period. This would enable you to slice the data in yet another direction: Isolate sites whose population densities have grown during this period, and comparable sites whose densities have remained constant, to use as a control. Further, if you have not already done so, I would see some value in limiting the current study to sites whose population density has not migrated between classes during the period of the study. One further remark, not about the study but about the logarithmic effect of population: this would seem a very strong argument for the environmental irresponsibility of de-urbanization. It suggests that low-density populations can have proportionally much higher per-person impacts on a natural environment. Taking this data at face value, let us try a thought experiment: take everyone out of urban centers and move them into the country. Spread everyone uniformly around the continent. The data would appear to suggest that this would create a strong warming signal. Maybe the back-to-nature movement is the most environmentally destructive ideology yet! As one having a strong dislike for the city and cherishing dreams of retiring to a cabin in the woods, I find the above observation creates a moral dilemma. Would be curious as to your thoughts around what this means for the sat record. Allow me to digress for a sec: I think on your previous posts I and others have asked about the resolution of the satellite record and if UHI could be seen/demonstrated in it. From a spatial standpoint, because of convection and wind effects I would think we would see a severely diffused effect at 14,000 ft (ch05) – which is where the UAH record comes from right? – so with that I think I have corrected myself from my previous train of thought… sat resolution at 14,000 ft doesn’t matter vs. the 1km at 2m population density analyses you’re doing here. I guess what I’m trying to get at here: for the most part CRU and UAH are at least in the ballpark of each other… so wouldn’t the spurious warming in one also be exhibited in the other? Maybe I have an issue here as well with the label “spurious” because the warming is quite real, but what you’re demonstrating (amazingly well I might add) is that what they’re calling CO2 induced “global warming” (most of it at least) is really UHI, and that by switching the population zone of the stations in the grids that signal can be readily demonstrated. This would then go back to the (rhetorical?) question of should we be correcting this out or measuring it – because for the sat measurements is it even possible to “correct” something like this out? One other nit if you don’t mind, I agree with your 4 reading average approach, but for consistency’s sake: could the difference between your method vs. the TMax/Tmin approach be responsible for any of the difference here? On your post regarding station drop out there was an unexplained 30% difference in variability (maybe 30+%) between your raw ISH analysis and CRU. I’m just curious if you had any feel for if that were due to raw vs. adjusted, 4-temp avg. vs. TMax/Tmin, your statistical method vs. their homogenizations, etc… and if that difference might also be causing unexplained differences in this analysis. If I wanted to discredit this work and re-affirm my belief in thermageddon, the obvious suggestion to make is that the stations have been pre-selected to give the desired result (Cherry-Picked). Now to some extent you have, continuous,undisturbed,regularly collected, properly recorded, traceable to standards data from properly maintained weather stations not being quite so common as perhaps it should be. But provided you can show a consistently applied, bias free disqualification/acceptance procedure you should be able to dispose of that line of argument fairly quickly. How does more recent data correlate with the satellite record? Did you consider using an ANOVA method to assist in assigning mean and variance differences to different attributes of the stations? 1. You write “This is a very significant result. It suggests the possibility that there has been essentially no warming in the U.S. since the 1970s.” That would only be true I think if there were no people living in the US. But there are, I have seen a lot of them every time I visited the USA [last visit was to NY so that might have been a biased observation -;) And their number has steadily increased since many decades. 2. Apart from USA (and possibly urbanized regions in other parts of the world): would your observation have much impact on the global mean, considering that almost 70% is oceans? Don’t know. But “Climate Change” seems like a good way to guilt the “rich” countries into sending money to those who have less, thus it represents a Noble Cause that is “Vatican Approved.” Anything to help the needy, right? 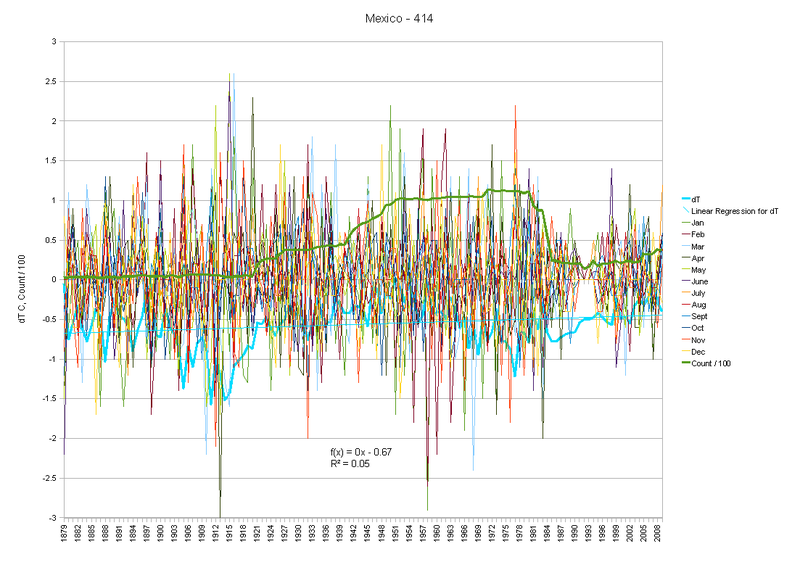 Hhe has finished working on the world data set (not all graphed yet) and his results are absolutely fascinating. His North American Analysis basically aggrees with Dr Spencer. Are there any such stations? How many? Where? Does anyone have information on this? If there is even a relative handful, it would be interesting (if not necessarily convincing) to know if they show any trend individually and as a group. Has anyone looked at forest fire observation posts for example? Most have structures, of course, but they may not have changed much. Most if not all collect weather data, at least during the fire season. Is temperature data from any of them included in the NOAA data? They are obviously rural and many date from the early 20th century or earlier. I haven’t been able to find much online in this regard, but I’m probably not looking in the right places. Surely someone has done some analysis regarding fire tower temp data. I’m sure I’m asking questions that have already been answered, but can anyone comment? Eeeeh luxury…… If I’d tried to get t’Ford motor company teh let me off wi 2/3rds of me regular checks unrecorded’ and wi at least one month a years stuff missin… they’d ‘ave ripped off me metaphorical testicles, wi red ‘ot blunt pliers, fed em to me whippet then made me watch all the episodes of sienfeld back to back sithee. Young people today, if you told ’em that, they wouldn’t believe ya….. I guess I wonder why there is such a need for a comprehensive evaluation of global temperature. If you took only the rural sites and used them as a consistent set, would that not be a good device for detecting changes? Simply avoid the UHI altogether. I was wondering why use the smallest pop density areas. If the temp increase is least for the same percent pop increase in already densely populated areas, then it seems that you’d want to use the data from the most densely populated areas, since it should change the least. Then I realized that you only used one pop density statistic, so by using the least densely populated areas you guarantee that there hasn’t been too much population growth. If pop density data were available for the time span of the analysis, you could UHI correct all of the sites and use all of them. This seems to be closely related to the observation that the better the data record is, the less warming can be coaxed out of the data. One or two thermometers turn Antarctica and Siberia bright red, while the country with the best thermometer record shows little to no warming for 150 years when corrected for UHI. The world’s population trend shows a sharp upswing starting before the upswing in average global temperature in the 20th Century. Obviously no density calculation is necessary here since the globe’s surface area doesn’t change much. As can be seen in the linked graph, the world population trend turns upward around mid-century. As I recall, average global temperature starts rising sharply after the 1970’s. So if increases in population density drive increases in temperature, why is there a lag? Have you checked to see if there are stations which have had declines in urbanization over time? And if so are they more heavily weighted in one subsample compared with the others? By which I mean that by selecting stations with consistent high reporting rates you have selected the subset of the “best” stations. My fear is that your detractors will attempt to colour this process as selecting to support the desired conclusion. Minor question: I’m interested why Dr. Spencer chose to average the four daily temperatures vs. the min/max like CRU? I couldn’t find the reason explained in his prior posts on this subject, although I may well have missed it. I don’t expect there to be any significant difference between the averages, but just seems one would want to compare apples to apples as much as possible to isolate the UHI effect. Great work. It would be interesting to know how your figures compare with satellite temperatures (see e.g. http://discover.itsc.uah.edu/amsutemps/). And are your data sets available somewhere? On further reflection, I can see my previous post would be a reasonable question if determining UHI bias in CRU’s temperature set, but not necessarily as a general test. Good and interesting read, as usual. I got a thought… UHI seems to be related to the actual temperature, as in the effect varies in size during day/night and summer/winter. Would it be possible to add current (or yearly average) temperature as a variable in the UHI analysis? Indeed. I would sugest that the absence of peer review as it is conducted today makes this article decidedly more “robust”. Peer review is just another phrase for group think. At least IMHO. A large part of the warming trend for some NOAA temperature data sets is the “time of observation” correction, which NOAA applies to adjust the max/min temps according to time of reading a max/min thermometer each day. It appears that this correction doesn’t apply to the stations you picked, as they had readings 4 times per day. Please confirm that TOB shouldn’t apply to the data you used. 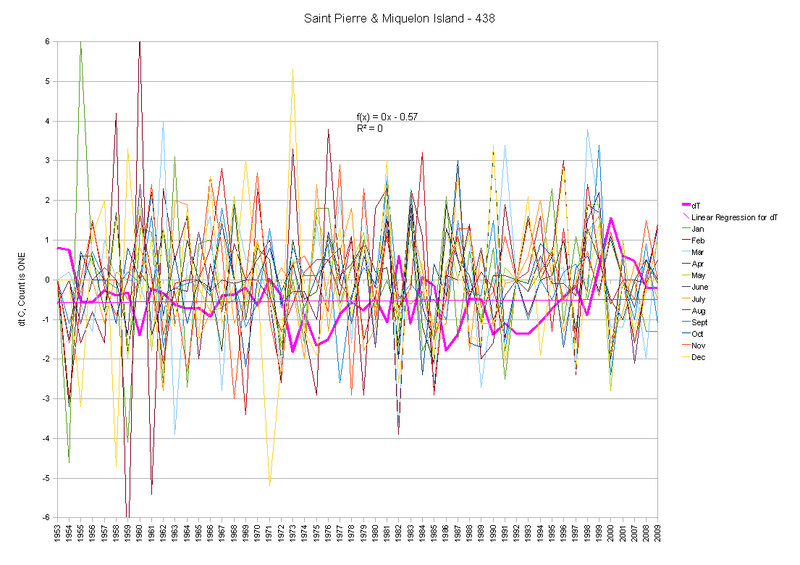 I suspect that most readers are confused, as I am, about the all the different sets of temperature time series. Total electricity generrating capacity in the UK is 40,000,000,000Watts. Total number of households is 20,000,000. Peak electrical power consumed per household is about 2000W in that case, most of which will appear as waste heat. This is matched by a similar amount of energy turned directly into heat by burning fuel. That’s 4000W peak output for every house in the country. I should imagine that if that heat energy can’t escape directly upwards perhaps due to heavy cloud cover, that much of it causes direct heating of the local environment. Temperature increase would be small, but a small increase is all we are looking for. But even given the low average pop density, that’s irrelevant. The point is that the warming is not a real global effect: the entirety of the trend is UHI and needs to be discounted. 4 points to make a graph ? Are you kidding me ? I’ll be as skeptic about your second graph as I am about the hockey stick. I good piece of work Roy and one that needs careful consideration. It would corroborate Ross Mckittrick and Nicolas Nierenberg’s recent work on Correlation between Surface Temperature Trends and Socio-economic Activity but also the simple logic that surrounding thermometers with concrete and asphalt will affect their output. The UHI effect is unmistakable. Although I also prefer simply methods, they should not be too simple. “I then compute multi-station average anomalies in 5×5 deg. latitude/longitude boxes”. The boxes will then correspond to surfaces with different areas. It would be better to use equal-area boxes [especially when the analysis is extended to other regions, e.g. Europe]. Alternatively [and THAT is simple] one could weight each box by its area when computing the region average. Perhaps that was done “The following chart shows yearly area-averaged temperature anomalies” may suggest that although the wording is not clear. Had Spencer said “area-weighted average” all would be bliss. This needs clarification. So Jones CRUT was flying hi above just to “hide the decline” (that red line above), nice, nice. I’m not sure how useful an average population density measurement is. The source data for Dr. Spencer’s analysis comes from here – http://sedac.ciesin.columbia.edu/gpw/ – and it has a pretty nifty Google Maps type interface that lets you see how inconsistent the population distribution is. Did I hear Nobel Prize for kids? I despair! The Vatican has got the climare references of much of the Roman empires- East and West. They are fairly episiodic until around 50AD but pretty good through much of the the Byzantine period until Constatinople fell around 1452. Pliny and others used to make numerous references to climate and from that we know that Rome had a serious UHI problem and towards the end of the Western Empire in 400AD the climate turned cooler. The records cover a large part of Europe, the Mid east and North Africa and rebut the idea of a constant climate as propogated by the Met office. Your suggestion about transferring sites across population groups over time sounds like a good one. Probably for most urban sites this will require a visit to the city archives, or national census data, as this kind of information is not readily available online except for census information on the largest cities of the U.S. going back to 1790 which can be found here, and which focusses on the 100 largest cities: http://www.census.gov/population/www/documentation/twps0027/twps0027.html. Perhaps the population for each site could be adjusted for each decade as is done by the census. This could also explain a lot of Antarctic warming UHI effect based on population. As we know, some parts of Antarctica are becoming eco tourist traps. Hundreds of scientists, cruise ships, supply ships, airports, runways, sewage treatment/storage etc. where none existed previously. Population growth is obviously the norm, but it would be interesting to know if there are any localities that have experienced a substantial decline in population and/or economic activity for which it’s possible to determine a ‘negative UHI trend’, or whatever it’s properly called. Has anyone tried to do this? Your model of logarithmic dependence can’t work at very low population densities (blows up to negative infinity). It also doesn’t fit the few data points you have very well. Extrapolating it is imaginative, but not very scientific. If Willis’ self regulating model http://wattsupwiththat.com/2009/06/14/the-thermostat-hypothesis/ is true, we would expect a temperature rise related to the amount of CO2 in the US compared to the amount in the tropics where the regulation mechanism occurs. 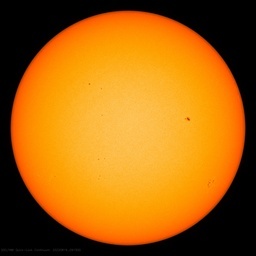 This seems to be proportional to the rate of production of CO2 in the northern hemisphere http://www.2bc3.com/warming.html. In short, I feel that imagining a zero value of temperature rise for the last 30 years in the US is pushing your idea quite a bit too far. You may want to re-examine the end of the first paragraph of the introduction. It appears to me that the words “at the lowest population densities” should probably be removed. I previously calculated (ref) a very rough global average urban forcing of 2.37 W/m2 based on electrical consumption – I would be curious what a similar exercise for heating oil, diesel, gasoline, natural gas would produce. Of course, all urban areas are not created equal, some are more dense than others, this would not account for higher per capita consumption for urban areas due to commercial use, etc. As others have stated, the per capita UHI relationship should not be assumed to be constant over time. As it pertains to Dr. Spencer’s analysis here, the question would be how much of that remaining .09 C/decade would that be? This is exactly the result that McKitrick and I got globally (J. Geophys 08). We found 50% of the land warming in the NASA record was from “non-climatic” factors. You can’t have a UHI over the ocean, so these findings apply to about 30% of the surface. After you factor in the relative warmings of each hemisphere separately, I believe the decadal trend will drop by .04deg–not an inconsiderable amount. The drop will be from 0.17 to 0.13; isn’t it odd that the 0.13 is almost exactly what the MSU shows? David44 (09:44:36) : Has anyone looked at forest fire observation posts for example? It would depend on whether or not the daily values are recorded or not. This also suggests that maybe the lack of recent warming evidenced in the tree ring data may have been more accurate than skeptics argued. The tree ring scientist have claimed that only in recent years has the tree ring data diverged from “actual temperatures”. So maybe it was in fact the “measured” data that falsely created the hockey stick. Forgive me if this is just unclear because I’ve only had the time to skim what Dr. Spencer has written. Is this saying no warming “at all,” or no warming beyond what is caused by UHI/Population growth? Detroit has been mentioned in the comments threads, and I think Gary Indiana experienced a similar population decline at some point in the past… but I do not think anyone has done more than discuss it. The real question for something like that is, how much of the UHI effect is consumption based (i.e. directly related to population) and how much of it is albedo and “thermal mass” based? Since population declines are rarely linked with wholesale demolition of structures and roads (true de-urbanization) this might be an interesting way to deconstruct the UHI effect into its component parts. To be clear, I do not think the up-swing would match the down-swing due to remaining roads and structures, but it would be an interesting analysis. They don’t need population to apply the UHI. Indiscriminate application of an inverted correction (aka “fudge factor”) can be/has been applied regardless of population density. Time for a completely open book examination, but I hear a dozen court cases are going forward and subpoenas can do amazing things. So, I suppose that means that two major tropical cyclones at the same time (http://wp.me/pduTk-2sE) in the Southwest Pacific has nothing to do with Global Warming, even though media reports make the connection by simply mentioning the charge? Off Topic but possibly interesting. Runaway Toyota’s due to solar minimum? Are there other computer glitches happening more frequently the last few years? Okay, first time failure of using html. It worked on the site I used to learn how to do it. Don’t forget increased agricultural activity, growing seasons, types of plants, watering intensity, soil color. Poor Tamino. But he had it coming. That’s a good point. However, if you look at the referenced graph on world population, you will see the trend accelerates to a slightly higher rate of growth beginning around 1920 and then to a sharply higher rate of growth beginning around 1950. Those born in the 1920’s would be middle-age by 1980 and those born in the 1950’s would be well into adulthood. Of course Spensor is talking about the U.S. rather than the world. I haven’t looked at the U.S. population trend and population density trend. Yes, the Good O’l USA is almost empty! I am wondering though, if the UHI is so widespread, at what point is it no longer just an effect that causes skewing of the data, but part of the environment? What I’m getting at is, all the extra heat that urban areas generate (and certainly this does skew the data as urbanization continues), but that extra heat in those urban area is still extra heat added to the total heat balance of the planet. Taken to an extreme, if somehow the entire planet were a giant concrete parking lot, you’d have a giant “heat island”, or would you simply have a different climate? These urban heat islands are, on some level, part of the environment, growing rapidly, and averaged over the whole globe. will add to warming. I think there are a number of corollaries for UHI (some which are corollaries for CO2, strangely enough) that should imply that the per capita UHI effect should also change around that time. Take, for example, number of cars on the road. For the life of me I cannot find a good source of historical information on the number of cars globally, but I would propose that starting after WWII this is at best a linear growth rate if not mildly exponential. There is also a point in time somewhere (probably related to economic/GDP growth) where a given country starts moving towards cement or asphalt roads vs. dirt/gravel for an “average” road. Air travel, as has been mentioned here before, really started to take off in the 60’s. Air conditioning and centralized HVAC adoption has had exponential adoption starting in the 60’s I think. Cement/masonry building construction in areas where it was wood prior definitely another post World War II trend. Were it not for the political/economic consequences of attribution of causation, the chicken-egg relationship here would almost be humorous. Cement production, for example, is a significant driver of CO2, but it’s also a significant driver of UHI. How much of its temperature impact is really one vs. the other? If the middle graph is plotted with a 1/log[Station Average Population Density] on the x-axis, won’t that give a nice straight line which will intersect at the y-axis at the actual decadal temperature trend? Built into your study are some assumptions that may not track. You assume that any temperature affected by an urban heat island is not an accurate reading. Of course, that’s not demonstrated anywhere. Were you to ask me about a research design, I’d suggest that you give serious thought to why actual heating in cities should not be counted as actual heating. If the city thermometers are not weighted to count more than rural and suburban measurements, the skew is nonexistent — it’s accurate readings of temperatures. There is an assumption that urban heat islands are not the result of global warming in any fashion. Again, no research to back that up. Airports and wild lands: In your discussions of airports, there is an assumption that, since there is concrete at the airports, they must be massive concentrations affected by their own heat islands. Not only is there little if any research to vindicate that view, any careful study of our largest urban airports would suggest a contrary case. The wildlands on the grounds of O’Hare in Chicago, for example, host flocks of ducks and a problematic herd of deer. Most of the airport is uncovered by either concrete or MacAdam — it’s grassland and forest. In an air pollution study, it would be considered a sink of pollutants, and I’ll wager it’s a sink for heat, too. Same with DFW, Austin and Denver, three of our newest and largest airports. For those airports on whose committees I have sat, or where I’ve had a chance to work with the grounds professionally, most of them would be considered far more rural than urban — Kansas City International, Wichita, St. Louis, Chicago, Toronto and Montreal, for example. Louisville and Lexington, Kentucky, probably are much cooler than their cities, but the cities themselves may not get much heat island effect due to their small size. Or consider the three airports around Washington, D.C. (Reagan) National is on the Potomac River, bordered by parklands and forested residential areas mostly. Dulles International was a country destination when it opened, and remains a largely rural enclave in a barely suburban setting. Baltimore-Washington International is largely wooded and wild, 20 miles at least from any significant urban concrete. Airports want to have buffers between their runways and people, for safety. Better designed airports, like Denver and DFW, have enormous stretches of grassland, and sometimes forest, between the ends of runways and any buildings. Larger buffers are preferred for noise control — at St. Louis, entire neighborhoods were purchased to get people out from under the noise profile. While airports are generally engines for development of a city, that development need not include massive concrete paving and tall buildings, especially at the airport. How many principal weather reporting stations are at airports, and which of those would you argue to be heat islands? Charles Higley (09:45:32) re using only rural data – that’s where I was going with my questions about forest fire observation posts. I think the usual problem even with rural stations, is changes to the local station environment essentially causing a mini UHI effect ala Anthony’s station survey project. FF lookouts may have some of this too, but I don’t know to what extent, if any, they have been surveyed. kwik (10:54:37) : Yes, I had seen that great father and son science project and find it pretty convincing if there wasn’t selection bias. I’m trying to think of places where temperature data is collected that are wilderness, i.e., essentially zero population, rather than merely rural, thus the FF lookout idea. A C Osborn (11:08:21) Yes, I think most lookouts do record temperature data because it’s related to fire danger, but don’t know how consistent it is. Anyhow this is getting off topic from Dr. Spencer’s post. Just wondering if anyone has taken a serious look at Forest Service lookout sites. to the one showing the temperature trends in the US from 1973 to 2009 by population densities but the first graph was showing the impact of UHI by population density. Is there a contradiction here or am I misunderstanding you. and actually saved the day for Dendroclimatology ! (i mean real Dendro, not that Bristlecone stuff). Look at the graph on wikipedia, it fits pretty good with the UHI explanation. And for a laugh, read the convoluted explanations on the page. It also made me take a second look at the Beenstock and Reingewertz paper discussed here on WUWT Feb. 14. Interesting stuff. 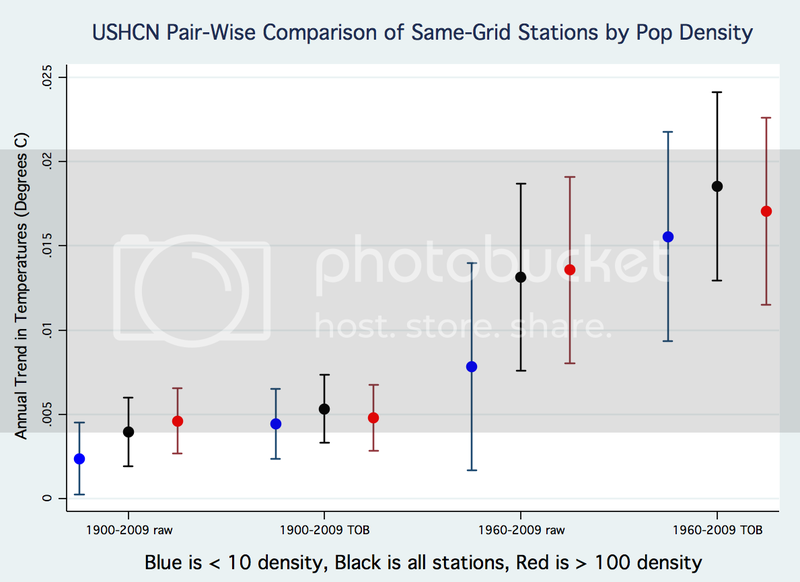 If a station in the US gets a bogus boost due to a poorly considered UHI adjustment, and then that station is used to infill another station 500Km away that is heavily weighted do to scarcity of stations in that grid space, isn’t the bogus UHI adjustment then transferred to that other station that received the infill data… and therefore also subjected to that sites crazy weighting? To me that seems kind of low and may reflect all of the US, not the continental US—Alaska is the likely reason because it’s half the size and has just over 1 person/sq m.
What is the possibility that poor US UHI adjustments “broke quarantine” and ran amok through the global record in regions with heavy infilling (Australia and South America as examples)? Obviously Australia is too far to get an infill from the US directly, but could it have gotten it second or third hand from other infill sites? Furthermore, could this UHI “disease” have also effected non-Infilled sites through “adjustments” of records that no longer correlated well to the “diseased” station records? A very convincing analysis. Congratulations. I know it would loose statistical significance but I would love to see the same analysis done for each of the 4 daily temperatures and for each of the seasons. This is not to prove a point but more to get some understanding of the nature of the UHI. Is it more in the day or the night? Is it more in the winter or the summer? Carefull. The warmists can come back and claim that that relationship is because more people means more FF consumption, and more CO2, and not UHI. I’m not a fan of tree ring proxies, but you may be on to something here. Well Dr Roy, you and Prof Christy, may be the first people in the field of climate science to actually find something that really does follow a logarithmic/exponential relationship. I’m looking forward to see what happens when you get this to a peer review panel and journal. Keep us posted on how that goes. Meanwhile Dr Roy, I hope you will forgive me for reposting an updated version of my ersatz essay from a coupla years ago, on Cocktail Party Physics. It’s down here on WUWT somewhere. Yeah, you and Prof Christy are still in the story; but I promise I did make you both look good. Well now that daylight savings time has started, which increases the value of TSI, the Arctic Ice Rot has set in, and the coverage, is starting to drop according to JAXA. So here we go again on the roller coaster. I have had difficulty getting reliable info on determination of daily average temperature. Obviously, average of 4 x 6 hour readings is better than av of max-min. For my work, I assume 1.1 x (max +min)/2, because I need to be conservative. Can anyone point me in a better direction. I am bewildered by the absence of temperature data going back to 1910 being released in great works such as this by Dr.R. Spencer.. I suggest you look at http://www.bom.gov.au ..
Their newly upgraded climate page has charts for temperature variations going back to 1910.. I think you may be especially interested in the chart of the relatively minor maximum temperature variation over the past century in various areas. The data sites chosen by the Bureau have “very little or no urban warming”, and the urban sites are not used in products such as monitoring long term trends in temperature. The Bureau also do not employ or use NASA_GISS standards for their temperature data. Your question has been asked here before. IIRC, less than 1% of the Earth’s surface is taken up by urban cities. Kind of hard for the heat in such a small areas to have much impact on a global temperature unless it was substantial. As for this exercise, I would classify this as a “sanity check” for temperature products like GISTemp. If the owners of the temperature products wanted to understand whether their adjustments seemed reasonable, then this type of analysis should be helpful. How raw is the raw data that you used? Assume no TOB … what about instrumentation changes, etc? What do your satellite data for CONUS show over the ’73-09 period? Pop density in the US not including Alaska is about 36/km2. In 1960 there where a total of 108 billion airline passenger-kilometers flown. In 2000 three were 3 trillion passenger-kilometers. We’ve had a 30 fold increase in air travel…the vast majority of the worlds thermometers are at the airport. But the world population has only doubled. Business’s like to locate near transportation hubs, people who need jobs locate near business’s. I stand firm that I believe these are not measurement “errors” per se, but from a surface temperature record standpoint should be, more or less, red dots instead of giant orange blobs. They should also be classified and represented as land use changes. They are, as much as I hate the term, a form of AGW but it’s not CO2-driven AGW and we call it AGW… everyone’s still going to say “CO2!!!! CO2!!!! !” So what do we call it? We’re getting back to the “It’s more complicated than the RC folks think” – an idea that has always run through my head when I look at the “consensus” storyline of the climate. What really gets me is that the mainstream surface temperature reconstructions (GISS in particular) allegedly have already “over-corrected” (according to Hansen or Schmidt, not sure which one) for UHI and still trend higher than Dr. Spencer’s raw reconstruction. They’re already off by a significant margin before you even start to consider UHI – which makes it almost farcical. Then you also have to consider that per the IPCC, “land use” changes are a negative forcing (~.25 W/m2). If they are really a net positive forcing due to UHI then it means something on the positive forcing side has been exaggerated above and beyond the implications of the lower average global trend that – according to Pat Michaels – would probably be .13 instead of .17 (so ~30% overstated?). That is a very good point. While I thought I had read that “urban” areas accounted for 1.5% of the land surface (maybe the less than 1% is total earth surface), that only accounts for less than 50% of the world’s population. The other ~3.9 billion folks live out there in the “non-urban” areas – whatever that means. So that means for every country in the world “urban” areas are at least 950 people/km2 – which is already almost off Dr. Spencer’s chart. When I went looking I was thinking “oh this is going to just be noise”… but when you look at Dr. Spencer’s chart and then start to think about, for example, what % of the world’s land surface is 25 people/km2 or greater, and then it’s not quite so insignificant. If we had sufficient truly-rural stations to rely on, we could just throw all the other UHI-contaminated data away. Way to go Spence! Well done. In my opinion it might also be shown that during the average twelve hours of nighttime, light winds that tend to carry the UHI effect (energy) over rural areas affect the temperatures to a greater degree than in the nighttime to daytime transition. Warm or even hot surfaces transfer the heat energy during early evening hours as they cool but there is no such effect in the night to day transition, nothing to ever counteract this UHI effect. Follow the energy flow in time as it flexes every diurnal period! There is excess energy in the UHI areas but there is no such thing as a “Rural Cool Island” effect to carry ‘negative’ energy to the UHI areas in the night to day transition. That’s one funky way to look at it, but should be correct in the diurnal sense! That should account for what we see in the slopes of minimum and maximum temperature graphs in rural stations. The nighttime slopes are always greater and the maximum show little effect across ~115 years except in rare cases and these probably have other effects occurring to account for this discrepancy. My comment above should not take away from Dr. Spencer’s presentation in any way, with max and min separate graphs not showing this effect, you just never see it but instead it is inferred to me by his concept. Another thing comes to mind, and this is in an area I have little expertise in, can the lights at nighttime that are making it impossible to find a truly night sky if you want to take a telescope and look at the nighttime sky cause a tiny UHI effect during the nighttime? Can this SW radiation from mere lighting reflect and absorb enough energy in the gases of the atmosphere to cause some of that increase of the slope of minimum temperature readings? Gases can hold little energy compared to solid or liquid matter, in other words air is easily heated (low specific heat) and is hard to radiate it away (low emissivity). That I don’t know. But in high population dense areas, many people do not to have lights on at night, it’s already bright enough. But in isolated homes and businesses in rural areas, they are in near total darkness and most would naturally add outside lighting for safety reasons. That is why we no longer have dark skies. That single factor should take on an exponential curve also against population density but may prove too tiny to bother with, but maybe it doesn’t. Roy, an additional analysis with day and night being separated may prove fruitful with proper physics principles backing it. Also, while looking up NOAA/NCDC stations, the population for Boulder stood out (being over a million) and I don’t think that is correct. 🙂 How many other populations are not correct? Remember, this was only my opinion, being a transfer of possible knowledge or an alternate viewpoint. If you are an AGW proponent and want it, take it, otherwise, just ignore it. These comments are just that, comments, not scientific papers, they come later. This would make things very neat and tidy – if it weren’t for the fact that MSU shows a US warming trend of 0.22 deg per decade, i.e. about the same as the GHCN trend. I don’t know if this point has been raised, but what does a flat temperature line during the period in question say about sea surface temperatures as the oceans warm or cool the land masses. This would seem to suggest that they too must have had near zero anomalies. While not tested, I would not be surprised that this pattern repeated in other regions of the world which if true would also point to stable SSTs during this period. I dont have the math anymore to argue the statistics, but I like the approach of testing the UHI contamination to the thermometer record (raw) and then using that logically to filter the UHI component out off the temperature record as an attempt to measure real national warming over a significant land mass. The UHI is a testable. There is nothing wrong with the arbitrary starting point as it meets basic criteria, maximum data integrity and the time line of policy approaches to warming attributed to man made CO2. You really do raise some valid points. I know that this thread is supposed to be about the unreliability of the temperature data because of UHI, but it certainly does make sense that the very thing (i.e. urbanization) that is “skewing” the data, is also creating real heat that spreads into the global environment because so far at least there are not any bubbles built over the large maga-cities like NY, Tokyo, London, Singapore, Syndey, LA, etc. But the heat from these cities spreads globally, and certainly, by some fraction of degree, they certainly must raise the overall global temperature. Interestingly enough, the energy to produce this heat comes from many sources, and not just fossil fuels, with the primary source being probably sunlight. Sunlight striking brick, concrete, asphalt, metal etc. will turn that energy into infrared heat energy, versus the sunlight that falls on grass and trees, which is mainly converted into chemical energy. In effect then, the cities become turn into little (or mega) UHI generating islands. The final twist on this is of course the fact that the megacities both increase the overall heating of the earth, but also are net producers of CO2, whereas the plants or ground cover in existence before there were cities probably used more CO2, or at least were carbon neutral. To the extent then that rising CO2 levels really are a global climate issue, the heat and CO2 produced by cities becomes a multi-threat to the global climate status quo. Where will this all end? 1) Humans will continue to expand and use up all resources and we all die. 2) Humans will perfect fusion technology and with an infinitie amount of energy we can make the earth into a garden of eden and we then expand into the Solar System and beyond, until we contact an intelligent civilization that either greets us with open arms, enslaves us, or finds us tasty and serves us as snacks at their alien parties. 3) Humans will muddle along in their human like way until the next glacial period comes and everything we’ve ever built is covered with 2 miles of ice for the next 100,000 years. 4) A coronal mass ejection wipes out 99.9% of life on earth and the whole thing starts again. “In short, I feel that imagining a zero value of temperature rise for the last 30 years in the US is pushing your idea quite a bit too far”. There are many places in the Southern hemisphere that are truly rural and which need no UHI correction. Among them are many that show zero or negative temperature change over the last 40 years, but there is a lot of noise. Trend fitting is questionable in individual cases but might have significance when you combine many cases. The logical first assumption is that there has been no global temperature change. If you then observe that there might have been a change, you seek an explanation. That’s all Dr Spencer has done. If you believe that it is unlikely that parts of the world have avoided a temperature change, then you still have to explain the many rural sites where there has been no temperature change. Look again at Macquarie Island, out in the middle of nowhere, influenced almost not at all by the hand of man. There is very minor infilling of missing data. Data from Bureau of Meteorology, Australia. Why does it look immune from GHG? Thanks so very much for your diligent work Roy. Your work aligns perfectly of my observsions in my rural are of S.MN……Temprature over the last 120 years is just very slightly positive. So if all would be contributed from increased level of Co2 in the atmosphere, we could surmize that yes Co2 has a small positive effect on surface tempratures. But as I suspected it is so very small the slight warming is definitely a postive effect on mankind. To bad the scientists can not un-lock themselves from the politics and see the light. Yes the increase from 350 ppm to 390 ppm warm the surface ever so much. But the empirical data shows as the co2 increases it become a smaller and smaller positive and surface tempratures concur with that……..John…. The thing that bothers me is that I’m not sure there is a completely satisfactory explanation for your results. Let’s consider a hypothetical case. In 1973 the population density of Smallsville is 10 per sq km; in 2009 it is 20 per sq km. Although its population has doubled it’s still in the low population class. Metropolis (can’t think where I got these names from), on the other hand, had a pop density 500 per sq km in 1973 which is the same as in 2009, i.e. it’s unchanged. If population density were a factor then we might expect the temperature trend in Smallsville to be more affected than the trend in Metropolis. What I’m saying is that there doesn’t necessarily seem to be an obvious reason why a low density population station should be any less ‘contaminated’ than a high density population station. In fact, in one of your previous posts, you implied that there was a log relationship and that a population rise in a rural location would, therefore, have a disproportionately greater effect than a similar rise in an urban location. Now I’m not familiar with US demographics so it’s quite possible someone is going to tell me that population growth in the past 30 odd years has been restricted almost entirely to the major cities. If so – fair enough – that answers my point. But failing that – are we quite sure there isn’t a regional effect going on, i.e. is it possible that a number of the low pop stations are clustered in a region of the country which just happens to have warmed at a lower rate. Unlikely, perhaps, but I still think it needs to be ruled out. NO statistically significant warming from 1995-2010 while C02 increased by 30+%. In my book that is enough to reject the NULL: Mean Global Temperature (>) greater than (i.e. AGW) than historic mean and supports the ALTERNATIVE HYPOTHESIS Mean Global Temperature (=<) (Skeptic) equal to or less than historic mean temperature. Plus Jones admitted that from 2002 to 2010 there has been slight cooling. He further admitted that the MWP was as hot if not hotter than today. This is a critical to getting some sanity back in the discussion of science in our society today. Keep at it Roy, you’re doing fine. Is there an upper limit to UHI? Lon Hocker (11:01:45) : In short, I feel that imagining a zero value of temperature rise for the last 30 years in the US is pushing your idea quite a bit too far. I made a variation on First Differences that I call dT/dt. The variation is that I start in the past going forward to make the anomalies, but start in the present and take my anomalies running total going backwards in time (on the assumption that “now” is a better record from better instruments than 200 years ago… an assumption I’m increasingly doubting 😉 and on a “gap” in the data FD will “reset” to zero while I just keep waiting for a valid data item and put all the change in when one shows up. (Thus, if there were a 0.1 C / year trend and a 5 year gap I’d expect to put +0.5 C in when that valid datum shows up…). This preserves trends better especially with holey data (and the data has a LOT of holes in it…) while not having any “imagined data” used at all. (No in-filling or any other estimating… just pure data, straight.) Oh, and I calculate the anomaly by “month of the year” comparing only January to January and December to December. This avoids all the fallacies of averaging temperatures (an intensive variable…) and all the issues around data dropouts being different by season et.al. In exchange for all that, it loses the “feature” of automatically adjusting to things like equipment changes. (That ‘reset on change’ behaviour…). To me, this is an added feature as I want to see the impact of the changes. That’s what I’m hunting for: “What Changed” that could bugger things? This is ALL DATA, so those early years are ONE thermometer (that’s why it’s so volatile in the early years…). About 1816 you can clearly see the Year Without A Summer. By about 1825 we’re up to around 25 thermometers and the graph settles down at the zero line. We have a cold period, then a very hot 1934 era, cooling into the GIStemp baseline, and warming back to the 1998 peak. Ending back at zero today. (“Now” is defined as zero as I run time from now into the past…) So, with all that preamble, notice that about 30 years ago we are again at zero? Oh, and this is the GHCN “unadjusted” data and has, in theory, no UHI adjustments done to it at all. Basically, this was as close to the “raw” data as I could figure out how to get and as close to “pure anomaly” as I could create. All “unadorned”. To make it easier to see exactly, here is the text version of the data for The USA which is most of the data used to make that chart. You want the “dT” line. I’ve cut this table at 1800 when we have all of 4 thermometers, as before that I don’t see much real usability for averaging reports. You will notice that 1979 and 1980 are both -0.38 while 1978 is +0.34 which to me says “pretty much zero +/- annual jitter”. So at the end of the day, it looks to me like Dr. Spencer has it “just right”. Now I see what you are doing Roy. Well done. You’ve given credibility to the data by using a 1 km grid square for population density. The temp data is just as chaotic for sample area, but the UHI effect associated with population density is proved for a station’s report of temp. Interesting work. As with all data on climate change it tends to raise more question than answers in me. Whether it confirms or contradicts my own personnal outlook. I’m hoping that’s the correct position to take as a true sceptic. So I have some questions which either the author or somebody in the know might answer for me. 1) Has anybody in the literature taken this sort of approach to UHI? What were their conclusions? 2) Can you do the same analysis using the satellite data? Would that back-up the findings? 3) Can you analyse temporal changes with this method? What a serendipitous occasion to come back from a vacation and have such a clear analysis to read. Thanks!! However, your earlier article did show a slight variance from the U.S. and the rest of the world especially in the lower pop density. So, I think a “rest of the world” analysis would be in order to be able to apply your findings globally. Given the clear methods you’ve given us, I’d do it myself, but then I’d be stealing your thunder. (lol, not really, I’m lazy and am more comfortable critiquing and cheering from the sidelines.) Also, (and I’m not sure if you’re planning to go this way or not) a time study should probably be done going further back, comparing UHI per points in history. Obviously, there are significant differences in UHI components in a town of 50,000 in 1920 compared to one presently. I see you’ve brought some detractors to the site. GREAT WORK!!! You know you’re onto something when that happens. pat michaels (11:06:21) :……I’d say that his would probably show a more significant divergence. I’d also say, that your right about the oceans, but that’s not what was measured to come to the warming conclusion(not significantly) by the Jones’ and Hansen’s ect. and then I’d probably commence about the oscillation of currents and winds ect., but then, I’ll probably wait for the final chapter of Dr. Spencer’s analysis. Few more questions I forgot about. 5) There is usually a call for confidences and uncertainty measurements with this sort of data. Any available? 6)From your update “If the population densities for a pair of stations are exactly the same, we do not include that pair in the averaging.” Would these not act as good ‘negative controls’ for this experiment? Living in Shanghai, A thought occurred to me as I read your article. There is a huge migrant worker population, living and working in the major Chinese cities. Every Chinese New year the vast majority of these workers leave the UHI cities and travel home to the provinces for at least 2 weeks. Indeed, Shanghai became a ghost town just a few weeks ago. Traffic levels drop to probably 10/20% of normal levels. House heating is turned off (Mostly reversible air conditioner units). Factories shut down etc. I was thinking along the line that there must be a change in the temperature of the major conurbations taking into account the UHI effect. Has anyone noticed this or recorded any difference? It’s apparent from the video that the selection criteria were sites over 150,000 in population where there is a relatively close rural comparison site, and both sites have full temp history over a century. As far as I can tell, they included all sites that fit that criteria. A VS is putting on a great show…..link to comments. Eli and Tamino roughed up a bit. Hmmm… spurious warming for 2% of the surface of the planet, IF you believe this rather labored and complicated reasoning is statistically significant. … the UAH record is confirming the GISS record and near-record highs set in the last five years. The planet’s atmosphere is heating up at a high rate. The oceans are absorbing massive amounts of heat that swamp the heat buildup in the atmosphere. Isn’t this the important message? How long do you believe that CONUS won’t show the heating evidenced across the planet? And to keep from being too US centric, what about our neighbors to the north? 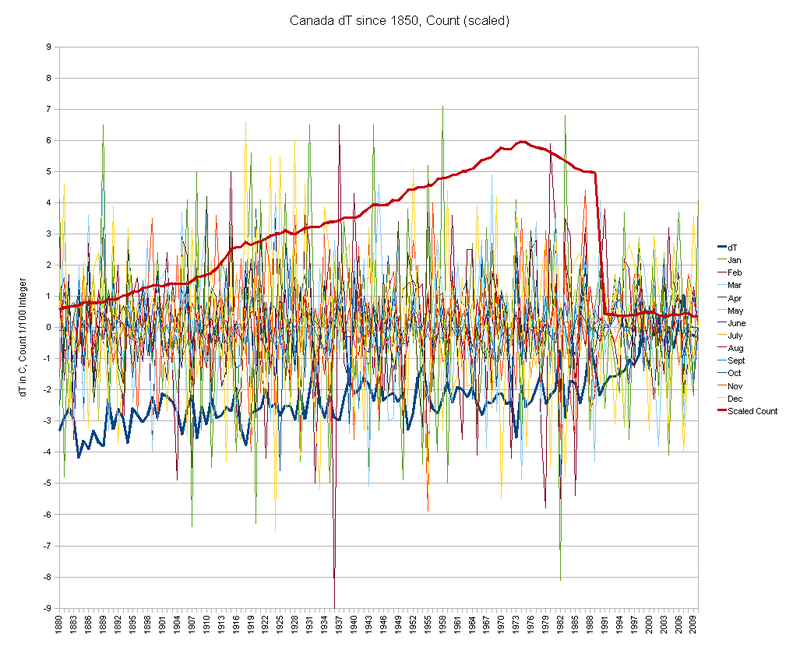 Is there also only spurious warming in Canada? Or for that matter, Alaska? Or Mexico? Or even the Western CONUS? I guess I just don’t understand the significance of this work. Tamino’s fury and the technical complexity of his posts are in direct proportion to the weakness of his case. He basically invokes all this irrelevant technicality in order to try to bludgeon his less informed readers into belief. Its very funny stuff. For another classic example, go through his posts on PCA. All is fine until the last, when he tries to justify using the mean of a subset of the series instead of the mean of the series. He does not explain why, if this method is so good, its not generally used in, for instance, medicine. It would be funny were it not sad. Thank you for posting on Anthony’s WUWT. Congratulations on writing [once again] science in clear language. Your article provides great leverage for a cultural shift about how science can do its business. Anthony – Thank you for providing a vehicle for transmitting the antidote against compromised science/scientists that form the root of the CAGW agenda. True, it’s kind of hard to completely separate the affects of CO2 and UHI on temperature increases. I’m not aware of a series on world motor vehicle registrations. A proxy of sorts might be annual global crude oil production(1960-20008) available from DOE. However, I don’t know if this series is a reliable indicator of trend. I went VS-Comment searching at your suggestion. I learned some ideas of statistics in short order. He/She comes across as an objective observer. Yes, VS is providing Tamino-san [I am in Japan today, so going with the -san honorific] with some challenges. I have to pretty much agree with VS that dhogaza is actually Tamino/Foster. If you subtract all the dhogaza posts from that thread, and the VS responses, there are not many other posts left. Since “tamino” is silent, it could well be that “dhogaza” is tamino’s sock puppet. That’s the hypothesis. Falsify it, if anyone can. Yeah this is a great read. It makes more sense than many I’ve read. Dr. Spencer don’t bother responding to “Paul K2”. He’s not interested in trying to understand anything or learn anything new. The findings conflict with an article by Long previously featured on this site. Perhaps picking different stations gives different results. NO statistically significant warming from 1995-2010 while C02 increased by 30+%. In my book that is enough to reject the NULL…. A very nice example of merging 3 fairly flat stations in one grid /box in Coast Rica and “finding warming” as a result. The population density data is at a nominal 1 km resolution, available for 1990 and 2000…I use the 2000 data. Which naturally leads to a question about comparing 1990 data to 2000 data. Paul K2 (19:33:28) : And to keep from being too US centric, what about our neighbors to the north? Is there also only spurious warming in Canada? Or for that matter, Alaska? Or Mexico? So if there is any “global warming” in Canada, it all showed up as a step function in 1990. AGW is just an artifact of “over artful” data splicing and screwing around with the instrumentation while the experiment is in progress. Yes, it certainly is. Since GISS is horridly broken, it is a very important message that there is something very wrong with the UAH record. Dr Spencer – I suggest you look at maximum and minimum temperatures, seperately. I am slowly working through the Australian BOM database. I am finding that individual locations have enduring linear temperature trends, some rising quite rapidly, others flat or even falling slightly. But the Max and Min charts are qiute surprising. In some, max rises faster than Min, in others, the reverse. In some, either Max and Min are flat while the other rises sharply. and divergence between Max and Min. So far, I have found little evidence of a post 1975 acceleration and no sign of the very pronounced 65 year zigzag cycle, so obvious in global NCDC data. I will report in more detail eventually, but I am very slow. Last June/July I remember wondering how long it would be before posters on here started to question the satellite record in he event of a decent El Nino. The answer seems to be about 6 months. Maybe, but I’m just criticizing this curve. 4 points, to try to get a trend feels like not enough. And the fact it validates what’s expected is the exact reason you’d need something more precise. Imagine if the last one is just an error and should be 0.1 higher ? Or 0.05 less ? Your logarithm would be changed a lot. Wren (09:52:04) : Cement production, for example, is a significant driver of CO2, but it’s also a significant driver of UHI. How much of its temperature impact is really one vs. the other? What’s the difference between a few days and 100+ years? That was NickB’s comment. I know little about cement production. I would suggest that the absence of peer review as it is conducted today makes this article decidedly more “robust”. I see your point now. When you originally posted it looked like your concern was Dr. Spencer’s 4 daily temp averaging method vs. max/min – which I have commented on as well. I think the critique on the second graph (i.e. only 4 points to derive the curve) is well taken, but keep in mind that the underlying data uses (per the graph) 367 stations categorized into the 4 population categories, and these groups of stations (55 in Group 1, 73 in Group 2, 127 in Group 3, and 112 in Group 4) are what then create the 4 data points in question. This could be an oversimplification, but I would caution against thinking that every single station should fit exactly on the curve – a (significant?) amount of noise on a station by station basis should be demonstrated due to microclimate influences – the important part here is the general underlying relationship. Having all 367 stations individually plotted should allow us to generate a similar curve, but it might not be quite as clean and intuitive for presentation purposes. We’ve had a 30 fold increase in air travel…. And probably a 1000-fold increase in air freight, which is something not captured by passenger-related statistics. Wren was quoting me in his reply, so I hope I’m not speaking out of turn for responding… but is the “few days” a ref to CO2? The IPCC claims a persistence of ~100 years for CO2. I don’t agree with that necessarily, but I’m not sure if it can really be proven or disproven. This might be the worst possible example but this is really just a thought experiment, so lets say you want to put in a 500sf concrete patio , this will require ~6 cubic yards of concrete with a “carbon footprint” of 537 lbs/yard (ref) for a total 3,222 lbs of CO2. Lets say half of that CO2 stays in the atmosphere after a year and that portion is essentially permanent (ref) – we’re talking an effective permanent atmospheric footprint of said patio of 1,611 lbs or .73 metric tons. I think this is a fair back of the envelope assessment – but again, just doing a thought experiment here. Now this is when the wheels start to come off. For a straight albedo analysis (the usual standard for climate land use analysis) “traditional” concrete ranges from an albedo of .2 (old) to .5 (new) – ref. Compare that to the albedo of the well manicured lawn it replaces (estimated somewhere between meadow and savanna – ref) that should have an albedo somewhere between .1 and .2. I think what this means is that per a normal “climate” analysis, your concrete patio should be cooler than your lawn. Put another way, standing in the middle of a concrete parking lot you should be cooler than standing in the middle of your lawn! I’m not sure if I’m the only one who finds that counterintuitive… so I went digging for another way to quantify the thermal effects of surfaces and came across a measure called SRI which is a derivation of albedo and emittance (“also known as emissivity of a surface, is a measure of how well a surface emits or releases heat”). Trouble is, it’s relatively easy to find emittance and SRI measures for manmade surfaces, but the natural surfaces they replace is a big question mark (especially considering that “roughness” of the surface in question seems to be an issue, and most natural surfaces are rough vs. smooth man made surfaces). I keep hitting paywalls when I try and dig any deeper on it. So what can we conclude from this failed attempt to compare the heat island effect of concrete vs. its CO2 contribution? I think it’s safe to say that from a standard “climate” analysis of concrete, despite what common logic might tell you, replacing grass (or other natural surfaces for that matter) with concrete will have a cooling effect due to increased albedo. I’m not sure if anyone else is still reading this thread but… hmmm… that’s a little odd don’t you think? On one of the prior threads someone commented about a common sense analysis of the albedo measurements and predictions, I think after someone (might have been me not sure) mentioned that land use was a net negative per the IPCC due to “cooling” caused by deforestation. Which is the logical follow-on to grassland/farmland having a higher albedo (10-25%) than forest (5-15%) – ref. He said, again from a practical experience standpoint, that walking in a wooded area was cooler than walking out into a field. Now that could be due to you feeling cooler in the shade vs. when you have the sun beating on your head, but if you think about it from a surface temp standpoint (2m/6ft off the ground) I don’t think it’s *such* a stretch to imagine that a temperature station surrounded by trees would exhibit a lower avg. temp vs. one in the middle of a field (or for that matter, going back to my prior post, one in the middle of a concrete parking lot). It’s logical to conclude that replacing your lawn with cement would cut down on evapotranspiration, but does that really explain it? Another thought – if you look at green roofs – allegedly they can cut down on building cooling loads by 50-90%. I’m not sure what that means from a W/m2 or C perspective. I’m not sure if that really all is due to evaporative effect (as claimed) vs. diffusion of a “rough” surface vs. differences in emissivity… but regardless, it does appear that mainstream/consensus analysis has not given appropriate attention to this issue. Since UHI is mostly caused by land-use changes (buildings, roads, vegetation changes) and not energy-usage, I don’t think areas like Detroit & Gary will experience a decrease in UHI since these infrastructures don’t “go away” when population declines. In fact, I’d bet suburbs continue to be built at the expense of farmland surrounding those cities even today, and UHI continues to increase, tho more slowly. “…it is well known that clearing land raises albedo but lowers evapotranspiration. The first process cools the Earth’s surface, and the second warms it, but together they still cool the planet unless feedbacks negate that. I’ve read alot on this (maybe from Pielke, Sr — can’t remember), and clearing forests actually warms most areas, except in high latitudes like boreal forests that are snow-covered much of the yr. The amount of cooling evapotranspiration from forests is huge, and eliminating that causes temps to rise, but humidity to drop. Replacing lawn with concrete increases temperature because the concrete isn’t transpiring, and is in fact a heat storage unit that radiates long after the sun is gone. As for the affect from CO2 in producing the concrete, haven’t seen any measurable effect of that gas yet, so its lifetime in the atmosphere isn’t relevant. I did some back of the envelope calculations based on green roofs (ref) which claim, if my calculations are correct, that a green roof (i.e. a lawn – I used a 15% albedo estimate) has an effective albedo (albedo equivalent?) of 95%. So the “natural surface” component/variable in this particular case, offsets 80% of the solar gain it would be expected to absorb based on its albedo. In the event of a forest, if the ambient temperature is 80F (like the green roof example) the temperature at surface station height (2m/6ft – which is the “standard” for surface temp measurements right?) is probably going to be 80F too. I guess they’re talking about the top of the forest as the surface in question, but going off your comments and my calculations around the green roofs (i.e. I don’t think it’s such a stretch to think that trees would be about as good if not better for diffusing and rejecting heat gain) I think it’s safe to say that the idea that clearing forests and replacing it with grassland would cause a net cooling effect should be able to be disproven and rejected… which means ~.5 W/m2 of cooling in the IPCC models is errant. Regarding UHI and depopulation trends, I agree that most of the UHI effect is land use – which I think is also demonstrated by Dr. Spencer’s log relationship. The first thing that happens with development would be clearing of land and the installation of roads. I think, which might also be demonstrated by his log relationship, that at some point this effect begins to be saturated. Think Hong Kong or NYC, past a certain point the only thing structure/surface-wise that changes is that smaller buildings get replaced by taller buildings, but the footprint doesn’t change and everything other than parks in these cities has effectively covered by concrete, asphalt and structures for years. That said, as population continues to increase, consumption (think electricity, diesel, gasoline, natural gas, heating oil, etc) also continues to increase. I think it’s interesting to ask how much UHI is consumption based, and while Gary or Detroit might not be too useful, Pete H’s (18:51:18) comments on Shanghai are very interesting. I think someone could begin to quantify the relationship there with the right experimental approach. Replacing lawn with concrete increases temperature because the concrete isn’t transpiring, and is in fact a heat storage unit that radiates long after the sun is gone. Agreed, to compare one against the other we’d not only be talking albedo, but transpiration, and thermal mass (emissivity?). Now, there is another effect that I don’t think has been accounted for (maybe it would be under emissivity? ), and that is natural surface effects (i.e. leaves or grass): 1.) tend to diffuse reflected light vs. man-made surfaces (walls, roofs, roads) that are usually flat and smooth/smooth-ish and 2.) their solar gain blocks/shades the solar gain of the underlying surface vs. say, a patio or road where not only the concrete/asphalt warms but it warms the ground underneath it as well. What I’m getting at here is that I have a suspicion that the IPCC/”consensus” is not properly taking these other land use variables into account. In fact, I’m almost sure they’re not. I know this sounds ludicrous, but I have a sneaking suspicion that if your replaced all the earth’s non-snow/ice/water covered surfaces with concrete in the GCMs and/or Trenberth’s model that they *might* show a cooling effect! So I found a number for asphalt (Ref) of 61,000 square miles. This is 1.7% of US surface area, or roughly equivalent to paving over Wisconsin. For loss of natural surface cooling effect, per Scientific America’s claimed green roof results of a +5 ambient temp vs. +100 for asphalt (ref) one would expect this to be up to 8x range the effect of the albedo loss *if* every surface in the US that was replaced by pavement was previously the equivalent of a green roof. Whatever the actual effect is, it’s there and it’s very significant because albedo alone and its .34 W/m2 doesn’t even begin to account for the difference between walking in a shaded area or on the grass in bare feet during the summer, vs. walking on asphalt – and we all know that a cement sidewalk baking in the sun isn’t exactly cozy either with its -.68 W/m2 “cool” albedo advantage (assuming a middle of the road 35% albedo for concrete) over my lawn with its 15% albedo. So what can we say then about the forcing inflicted from replacing natural surfaces with paving? I think an educated guess here would be that paving over the equivalent of Wisconsin has resulted in an average forcing for the US of between .68 and 1.36 W/m2 – and that’s only talking about parking lots and roads. I think also, after digging into it some more, from a model perspective the land use assessments might not have factored in pavement and structures… and why should they? UHI has already been corrected (overcorrected according to Hansen if I recall) out of the surface temperature record so this doesn’t have to be accounted for… right? They wouldn’t, couldn’t have made a mistake like that could they? For this exercise, there is no way to really tell what the proper average natural surface effect should be. Not all roads and parking lots are put over the equivalent of a green roof, so a proper estimate *should*, I think at least, put us somewhere in-between concrete and the green roof (which I am using, for better or worse, as the best case scenario for the natural surface cooling effect). This could also be described as I am using concrete as the lower bound equivalent, and the green roof as the upper bound for the behavior of the “average” natural surface in the US. This implies that the natural surface cooling effect should be assumed to be the equivalent of between a 20% and 80% increase in albedo – which, to get to the point, means that when you replace a natural surface with a man-made surface the loss of natural surface cooling effect (as I’m calling it) should dwarf the change in albedo. This also fits with the common sense observation that walking barefoot in the summer on asphalt is more painful than concrete, which is more painful than grass. The middle of the road estimate – assuming median paving @ 20% albedo and median natural surface @ an equivalent of 65% albedo due to natural surface cooling effect (i.e. halfway between the concrete and green roof forcings established in the micro analysis) – is 1.54 W/m2. This, of course, also assumes that all of our fictional “median pavement” receives an average energy exposure – per Trenberth – of 198 W/m2. This seems to indicate that there is at least one land use change (paving over of natural surfaces) that is capable of having a very significant impact at the US scale and not just at the local level. Correct me if I am wrong, but it seems to me that Spencer has not taken into account changes in population density over time. What he has done is to show that stations with a low population density in 2000 had a much lower rate of increase in temperature over time than those with higher densities. That conflicts with Hansen-et-al ’s somewhat complex analysis (based on light emissions rather than then out-of-date population data) which concluded that though the UHI effect was measurable, it was small. Who should we believe, and why? If I were king – I would re-site all of the temperature sites to CEMETERIES. They are mostly park-like, very well maintained, ubiquitous, long-lived (pun intended) – and could be instrumented for automated data collection. In fact – cemetery organizations could be data PROVIDERS to the government. If so much depends upon this information – why not open it to competition – and see who can provide the highest quality data? I think Dr. Spencer’s work here is an observation, not a theory. I would agree – although I have not read the paper in question – that it seems to disagree (not sure “conflicts” is the right word for it) with Hansen’s conclusions as you present them. For an observation a point in time analysis is adequate, for modeling purposes, accounting for changes over time is of course necessary. We need to be careful about mixing the apples and the oranges. A minor nit: I don’t think population trends are so chaotic that, say for the US, using high res data from the census is innapropriate. I find it specious to think that light emissions could provide a useful, accurate snapshot unless they are using a data set like Columbia’s as the starting point and then using changes in emissions to model real time population changes. 1.) The average country from the Columbia dataset had either 14 or 17 % (sorry, don’t have it handy and working from memory) urban extent coverage. It’s no secret that a significant number of temperature stations globally are within these urban extents. The comon description of UHI is 1-2 C with little, that I have seen at least, understanding of its spacial effects – do we really think this has been accurately corrected out of the record? 2.) Why aren’t we measuring UHI instead of “correcting” it out of the record? Is it not real? Is it not also human-induced warming? 3.) In the US we have paved the rough equivalent of Wisconsin (61k square miles, 1.7% surface area) – and that is just a subsection of UHI. You’ve stepped on asphalt and/or cement in the summer… do you really think replacing natural sufaces with man made surfaces has a “small” effect? Is it even possible that before modern engineering feats humanity followed climate patterns, and so migratory history can be counted on to give us a good view of favorable climate conditions for humans? Maybe? Anyone? …The first process cools the Earth’s surface, and the second warms it, but together they still cool the planet unless feedbacks negate that.